Ad Majorem dei Gloriam! : Uno!! What is Uno?? 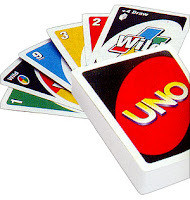 Uno is a card game played with a specially printed deck The game was originally developed in 1971 by Merle Robbins. It is now a Mattel product. The game's general principles put it into the Crazy Eights family of card games. we played this game, it was really fun!you can even bully one player. The rules is very simple, the deck consists of cards of 4 colors: red, green, blue, and yellow. The ranks in each color are 0-9.There are 3 action cards in each color, labeled "skip", "draw two", and "reverse". There are also special black action cards, "wild" and "wild draw four". The target is to make all your cards be thrown away in order to win . The player that has cards left in his hand after the game, became the lossers.